It never ceases to amaze me how John finds the time and the enthusiasm to encourage us trainers to part with our thoughts and secrets. You only have to see the results to know how good he is at doing just that, and some of the prices those horses return at are good examples of his in-depth thoughts. The results of his stable visits, along with his in depth thoughts on our horses is why you have to buy this well researched and informative book. John quietly chooses those horses who he believes will make you all a fortune during the next 6 months or so of the core jump season. 25 years is a long time in any working life and for John this is his 25th year of publishing the book, and I do believe I have one of the original copies; I certainly have had and seen most of them. 25 years of publishing and this looks the best yet. It is well known that John travels the length and breadth of the country in search of horses to feature in his Jumping Prospects books. It would be easy for John to go from big yard to big yard in his search for winners, but this is not the case. He will probably spend more time in the smaller yards, as this is where he will find his big priced winners. It has been a real privilege to have been asked to endorse this great book and it will highlight a constant stream of winners for the cold winter months. This will provide you with some cheer before the spring arrives and the Festivals begin. 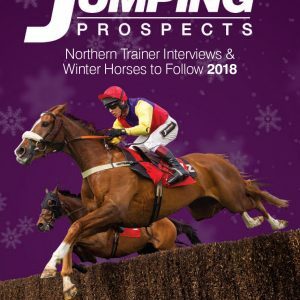 This is the must read ‘Trainer Interviews book of the season’ that is by far the best value for money of all the autumn racing publications that are out there at the start of the core jumping season. This book will keep you smiling whether you are on the racecourse or in front of the fire through the dark winter days. JOHN PARROTT Former World Snooker Champion, MBE & Racing enthusiast. Don’t wait until Christmas to buy this book. By the time Santa comes down your chimney you will have missed a sack full of winners! In my experience there are no short cuts to making a profit from the sport we all love, and the thousands of miles John is prepared to travel in order to talk to trainers face to face continues to reap huge dividends for himself as a professional punter and for his many devoted followers. Merely talking to a trainer does not guarantee profit so the promise of an interview means little unless you are skilful and persistent enough to make the most of it. This is where John excels and is the reason why those dark horses in stables up and down the country repeatedly find their way on to the pages of his books. The late Toby Balding, Legendary Grand National Winning Trainer, Put this in his Foreword in 2004. John’s knowledge of everything pertaining to Jump Racing is second to none, and his interpretation of the form book and the eye for unexposed talent is legendary, which makes this book compelling reading to any serious follow of the jumping scene.